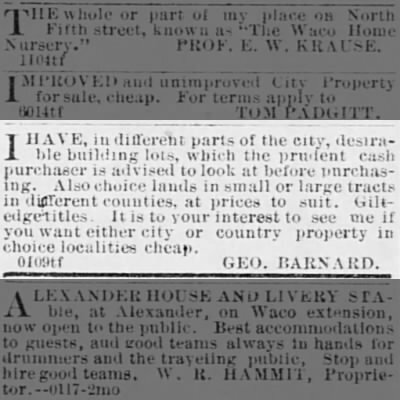 George Barnard was the first non-native permanent resident in the Waco area. Having been born in Connecticut and educated at Harvard, he then moved to Galveston in 1838. He joined his childhood friend, Thomas Torrey, on the well-known Santa Fe Expedition which resulted in his being captured by Mexican forces who then forced the prisoners to march to Vera Cruz. He recalled his time as a prisoner gravely and related that for awhile, his leg was shackled to that of another man who was suffering from small pox. He was forced to use a walking cane for the rest of his life as a result of the tortuous treatment and endless marches forced on him by the Mexican military. During the Santa Fe campaign, they crossed through central Texas and both Torrey and Barnard recognized potential in the area. Later on, Torrey employed Barnard in setting up trading posts along the Brazos after Sam Houston requested them for the purpose of developing positie Indian relations. 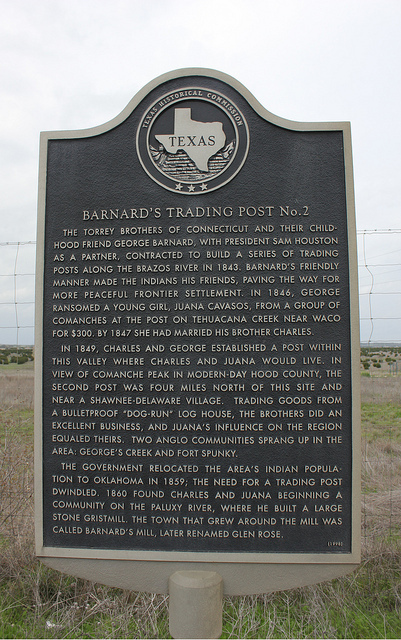 One such post was southwest of today’s Fort Worth and did well enough for a town to sprout up around it which was named for Barnard: George’s Creek. Another town grew around one of his posts in the same area and was called Barnard’s Mill. It was eventually renamed Glen Rose. One reason for his success as a trader was his impressive ability to interact successfully with natives. In fact, Barnard was well ahead of his time in developing the conclusion that white settlers had unfairly abused natives. This led him to advocate for the Indians on many occasions and he was known to have supplied natives with guns and supplies for resisting forceful removal to reservations. 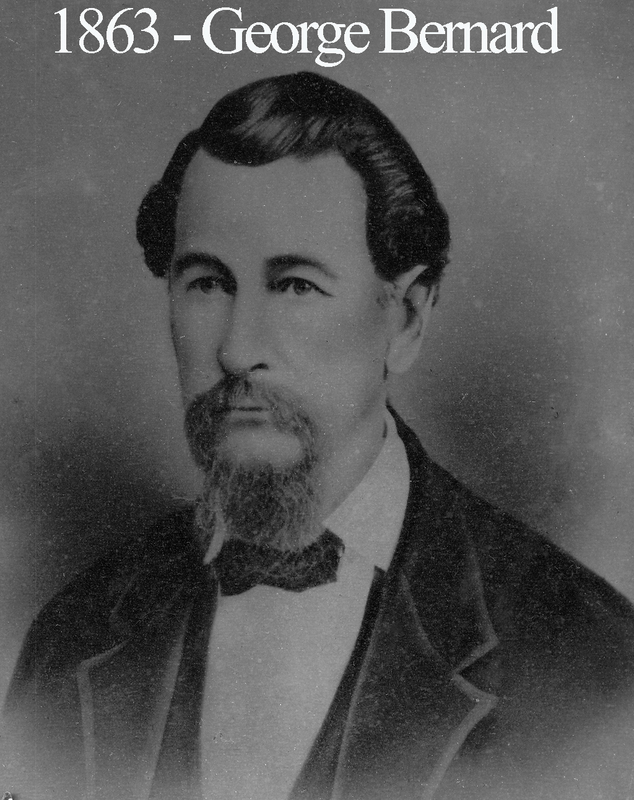 George and his brother, Charles(also a member of Waco Lodge), arrived to the Waco area in 1844 as the operator of a trading post on Tehuacana Creek. This made them the first non-native settlers in the Waco area. The post was located on a site that natives traditionally used for council meetings about eight miles from present-day downtown Waco and overlooking the aforementioned creek. He developed an incredible fur trade, producing pelts from deer, black bears, buffalo, and beavers. Among other things, he also sold gunpowder, lead, bullet molds, and hatchets, as well as colored beads, blankets, cloth, dress combs, bear’s oil and of course, tobacco and whiskey. That same year, his trading post was used as the location for treaty negotiations between then President Sam Houston, Comanche natives, and various other groups of natives related to the Waco tribe. When Waco Village was first plotted in 1849, Barnard moved his trading post there to be closer to what would become the city of Waco. This proved to be a most savvy business decision. Eventually, he sold his business to local investors and focused his efforts elsewhere. Upon moving to Waco, he purchased Lot Number 1 along the location that would become Bridge Street. He made his home near there and the property was expansive stretching from 8th street to 18th street and from Austin Avenue to Barron’s Alley which ran about the same line as Jefferson Avenuue today. He surrounded his home with a magnificent fence and imported exotic animals which were the talk of the town for several years. The home itself was located on the corner of 8th and Barron’s Alley, making it the furthest west household in the town in 1870. His wife was the daughter of Captain Shapley Ross, another prominent Waco 92 charter member with whom Barnard served as a Texas Ranger. In the late 1860s, Waco leaders had recognized that if Waco were to thrive, it would have to be well-connected with major railways so they formed the Waco Tap Railway Company. The goal was to connect Waco to the major railroad that already allowed for quick transportation between Houston and Dallas. Barnard was a primary catalyst in this movement and when it culminated with the connection of Waco to the major railways in September of 1872, he was the man to drive the final, finely crafted golden stake that completely joined the railways. Barnard died March 6, 1883 and the Waco firemen showed up in full to celebrate their first leader.